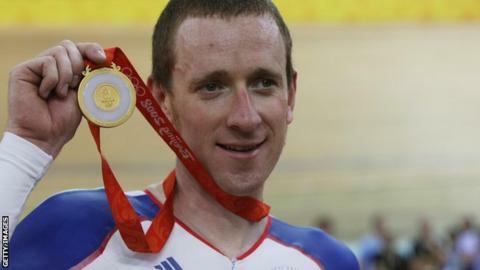 Sir Bradley Wiggins will face stiff competition in his quest to compete on the track at the Olympic Games in 2016, says British Cycling chief Ian Drake. Wiggins, 33, has won seven medals on the track and road, four of which are gold, at the last four Olympics and wants to return to the track in Rio. Drake said: "Bradley wanting to come back is great but competition is high. "Decisions are made on performance basis and podium performances, not what has been done historically." Wiggins won the time trial gold medal on the road at London 2012 to add to his collection of six track medals from the Beijing, Athens and Sydney Games. Only fellow cyclist Sir Chris Hoy and rower Sir Steve Redgrave have won more gold medals for Team GB - six and five respectively - and Wiggins has said he will quit road racing at the end of 2014 in an effort to emulate the duo. However, Wiggins, who left the track to focus on the road after the 2008 Olympics, has acknowledged that making a return to the Team GB track line-up would not be easy. And Drake warned: "The strength in depth of athletes that we have got now is phenomenal. "Everyone who pulls on the Great Britain jersey now knows they are in a fight for those places. "People have to earn that jersey. You only have to look at what happened in terms of selections for London 2012 with Jason Kenny and Hoy." Kenny was picked over Hoy in the individual sprint, despite the Scot being the defending champion, and repaid the selectors by winning the gold medal. Speaking at the launch of British Cycling's four-year strategy, which details the sport's ambitions to 2017, Drake said the governing body had not set a medal target for Rio but wants to support Team GB's aim to at least equal its overall medal tally achieved at London 2012. He told BBC Sport: "It's a massive challenge and one set by government. Can we be the first nation that has hosted a Games to do as well or even better in the following Games? "The medals mean more than medals. We want to contribute to those Team GB targets but equally as important is to get people riding bikes." British Cycling has set a target of increasing once-a-week participation by 125,000, while the body also wants to address the gender gap in the sport by getting one million more women cycling by 2020. New president Bob Howden, who succeeded Brian Cookson when he left to become president of world cycling's governing body the UCI, also wants to increase British Cycling's membership from around 80,000 to 140,000. Changes to the appointment of board members should also see the first women join the British Cycling board, with three of the 10 board members being appointed as independent directors, rather than elected.